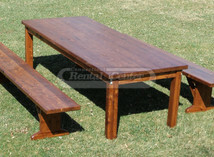 Need Farm Tables for your next party or event? 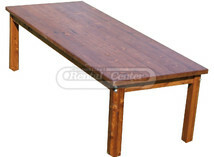 We've got the Farm Tables rentals you've been looking for. Browse our selection below. 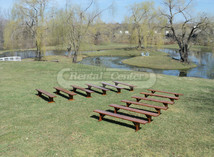 Farm Table Rentals in CT - Visit CT Rental Center to rent farm tables for your wedding - or any special occasion. 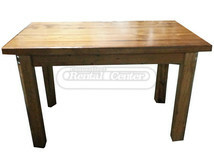 We have a wide selection of farm tables available for you to rent. 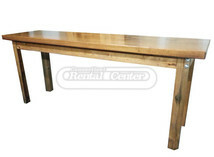 "Connecticut Rental Center had great service. They were very patient with us as we updated our order, and added and removed things throughout the process. They mailed us samples of table cloth, and napkin colors, and tried to get us the items that we really wanted. 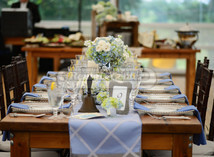 They also have a WIDE variety of items to rent, perfect for any wedding event. We used them for all of our rental needs as our location had nothing fancy to use to make it feel like a wedding. On the day of set up, the crew was patient as I described how I wanted everything set up. They were also very timely. A really pleasant company to deal with!" "Thank you so much for your support of our Love 146 Daughter's Tea Benefit Event. The tablecloths you donated for the event added a perfect touch to the room, anchoring all the decorations together. Thank you for your generocity, and thank you Amylu for all of your help."